As people age, plaque can accumulate in the blood vessels of the heart, narrowing the space through which blood must flow. This process is called atherosclerosis, or hardening of the arteries, because the buildup thickens artery walls. When enough plaque accumulates inside a person’s coronary arteries to reduce or block blood flow to the heart, that person is said to have coronary heart disease, or CHD. Angioplasty is a procedure during which a physician inflates a small balloon inside a blood vessel to press against and flatten the plaque, re-opening the artery. The goal of angioplasty is to restore adequate blood flow (revascularization) through the affected blood vessel. To prevent the newly opened blood vessel from collapsing or being narrowed or closed by plaque again, a physician inserts a stent, a tiny, expandable metal-mesh tube that fits inside an artery that has been widened by angioplasty. Some stents are coated with drugs that may help prevent renarrowing of the stent that may occur due to overgrowth of scar tissue during the healing process of the vessel after angioplasty. The drugs help fight the scar tissue that can form inside a stent soon after it has been implanted and promote the growth of smooth arterial tissue over the surface of the stent. 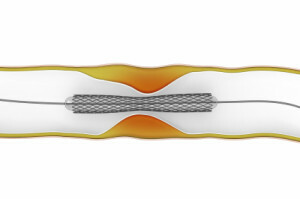 Drug-coated stents have been shown to reduce restenosis, or renarrowing, of the artery in certain blockages, which can reduce the number of repeat procedures. All patients must adhere to medication therapy after stent placement that inhibits the clotting ability of platelets that may stick to exposed metal prior to the artery healing around the stent. This “dual-antiplatelet” strategy typically includes aspirin as well as another agent such as clopidegrel (Plavix), prasugrel (Effient) or ticagrelor (Brilinta). With drug-eluting stents, there is a long-term risk for the development of blood clots in the stents — typically months after stent placement — that can lead to adverse cardiac events, including heart attack and death should dual-antiplatelet therapy be stopped prematurely. Therefore, the latest recommendations call for patients who receive drug-eluting stents to continue anticlotting medication for at least 1 year if they are not at high risk for bleeding. Decision to alter your medications should be done in consultation with your physician. WHEN IS THE PROCEDURE INDICATED? A risk of having a heart attack. Medication is the first line of treatment. When atherosclerosis is advanced or does not respond to medication, angioplasty and stenting are recommended, often as an alternative to coronary artery bypass surgery. Notify his or her physician of any allergies to iodine, which is used in contrast dye for some x ray tests. If the physician intends on placing a drug-eluting stent, the patient should tell the physician if he or she will need to stop taking antiplatelet medication prematurely, such as for upcoming surgeries or procedures. If so, the physician may discuss implanting a bare metal stent instead. A physician makes a tiny incision to access an artery in the groin or the wrist. Through the incision, a guidewire is inserted in the artery. A short hollow tube (catheter sheath) is then guided over the wire, and then a hollow guide catheter is inserted through the sheath. Using fluoroscopy (a type of “live motion” X ray that projects images onto a monitor), the physician guides the catheter or guidewire through the arterial system to the site where angioplasty is needed. The balloon catheter is passed through the guide catheter or over the guidewire to the point of blockage in the artery and is inflated. The balloon may be deflated and re-inflated until the blockage is flattened and the artery has been adequately opened. After angioplasty, physicians almost always insert devices called stents to keep the blood vessels open. A tiny, slender, expandable metal-mesh tube, (a stent) fits inside an artery and acts as scaffolding to prevent the artery from collapsing or being closed by plaque again. To place a stent, the physician removes the angioplasty balloon and inserts a new device on which a closed stent surrounds a deflated balloon. The stent-carrying balloon is advanced through the artery to the site of the blockage. The balloon is inflated, expanding the stent. The balloon is then deflated and the catheter withdrawn, leaving the stent in place permanently. Angioplasty and stenting takes between 45 minutes to 3 hours to complete. The patient must remain in bed for 2 to 24 hours following the procedure to allow the access site to heal. During this post-operative period, the patient is closely monitored for any complications. The physician may prescribe aspirin or other anti-platelet medications to prevent blood clots. The physician may also order a follow-up exam to determine the procedure’s effectiveness. Antiplatelet medications increase the risk for bleeding, and other healthcare providers may instruct patients on them to stop before a medical procedure, such as oral or other surgery. However, patients who have been prescribed antiplatelet medications following stent placement should contact his or her cardiologist prior to discontinuing this medication. Avoid baths for a few days. A physician may also prescribe a cardiac rehabilitation exercise program, such as walking.